Girl Scout troop was there making "friendship bracelets" a.k.a. survival bracelets. This nice young lady made me one. Thank you! 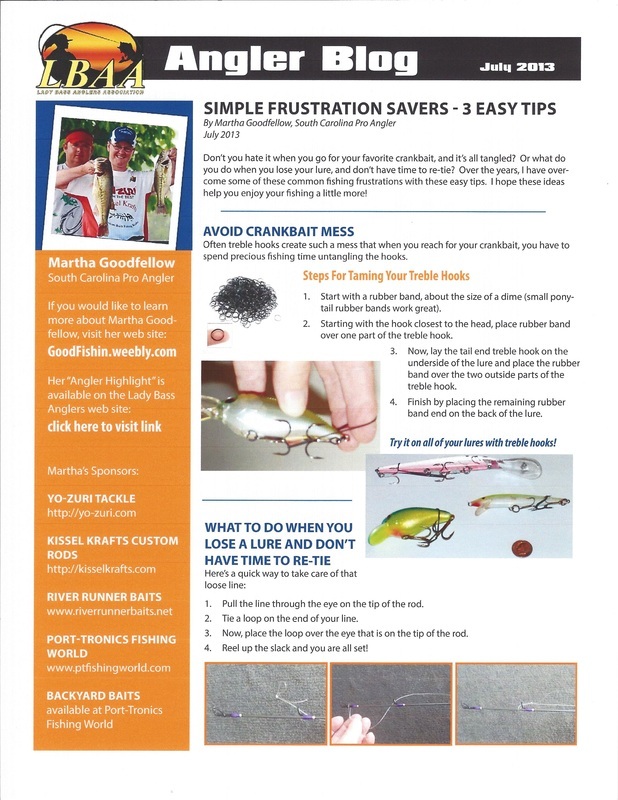 Sharing the basics about Drop Shotting,a bass fishing technique for lakes with clear, deep water. 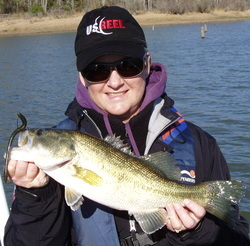 Great technique to fish for Spotted Bass. 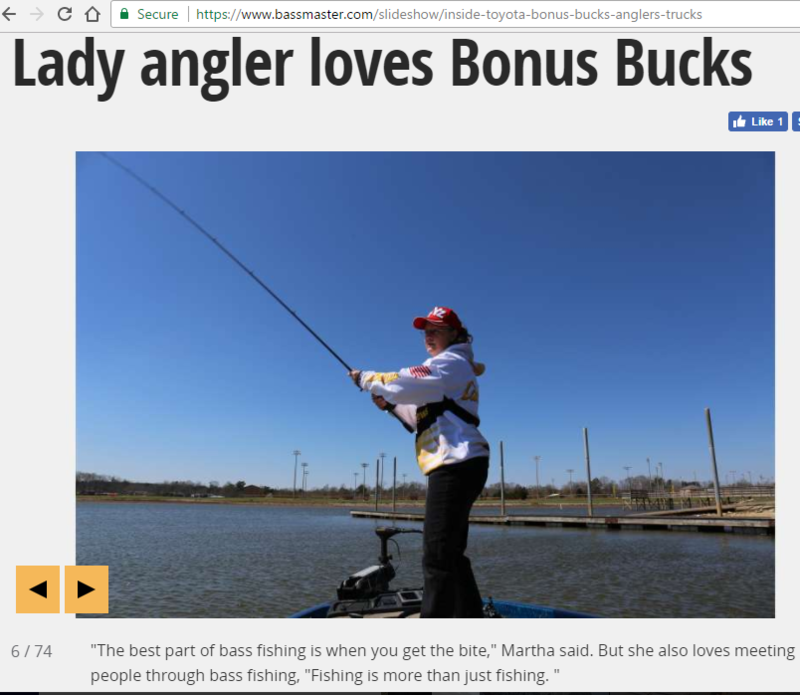 I chose to talk about drop shotting because I get asked a lot about how to fish with a drop shot and it's a technique that I really enjoy fishing. 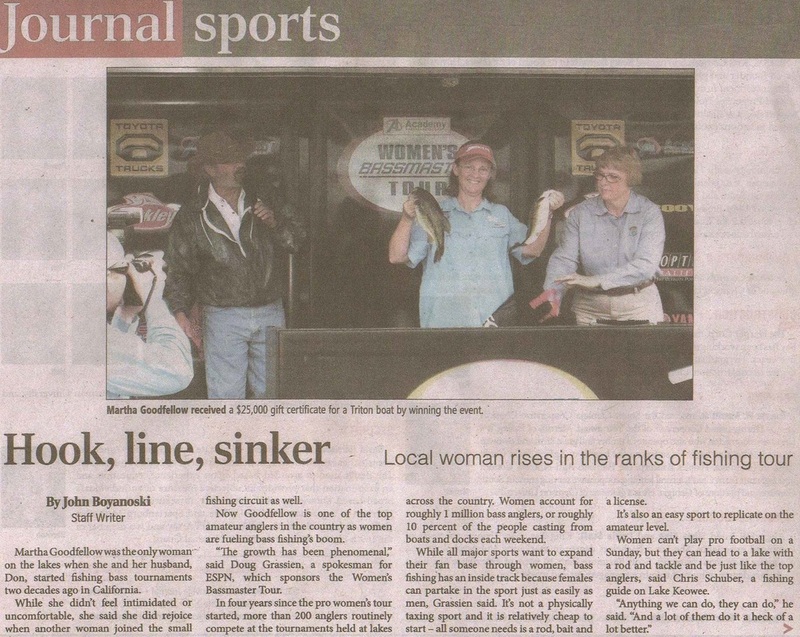 Imagine fishing directly under your sonar, marking fish, and "dropping in on them?" It's almost like a "video game or reality television." 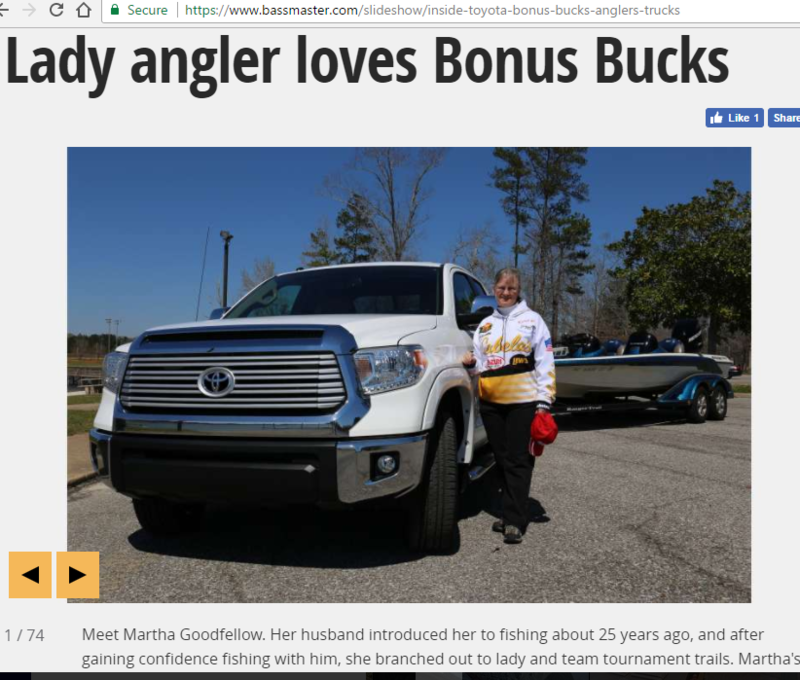 As your bait drops to the bottom, fish can follow your bait down and you wait with anticipation to see if they'll bite. It's fun! 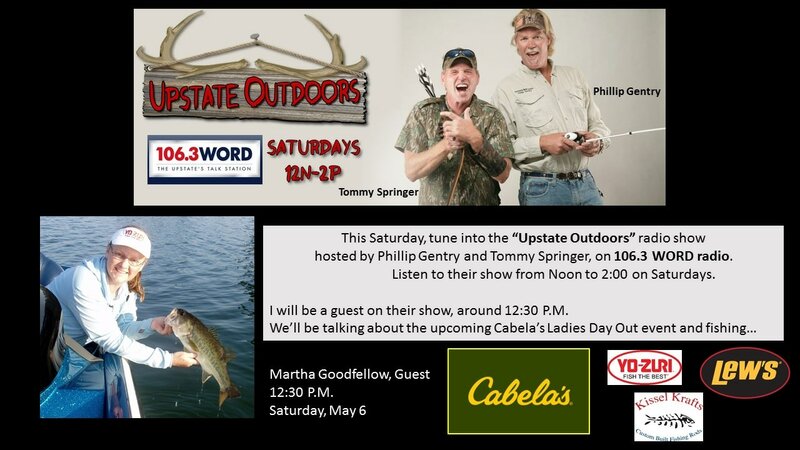 Thank you Phillip Gentry and Tommy Springer, hosts of the "Upstate Outdoors" show on 106.3 WORD radio, in Greenville, SC, for inviting me to be a guest on today's show. 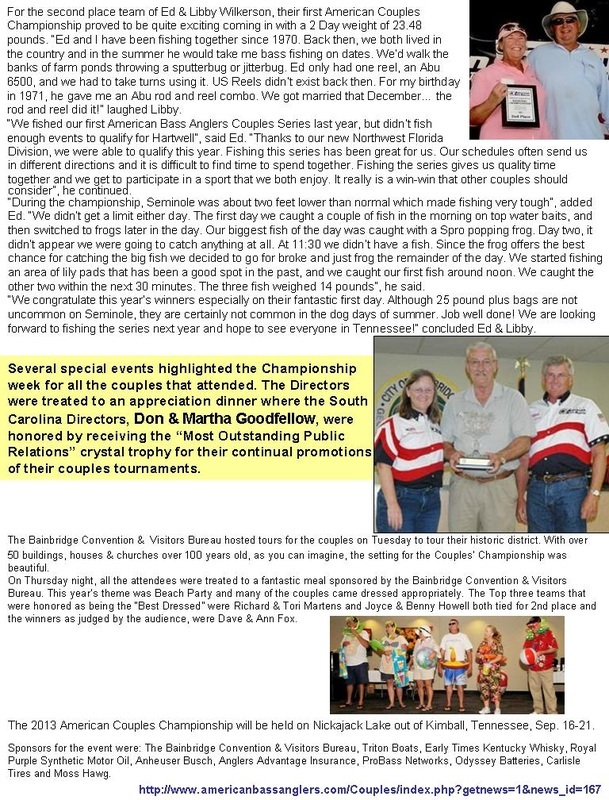 Keep on Fishing! You never know where your adventure will take you! 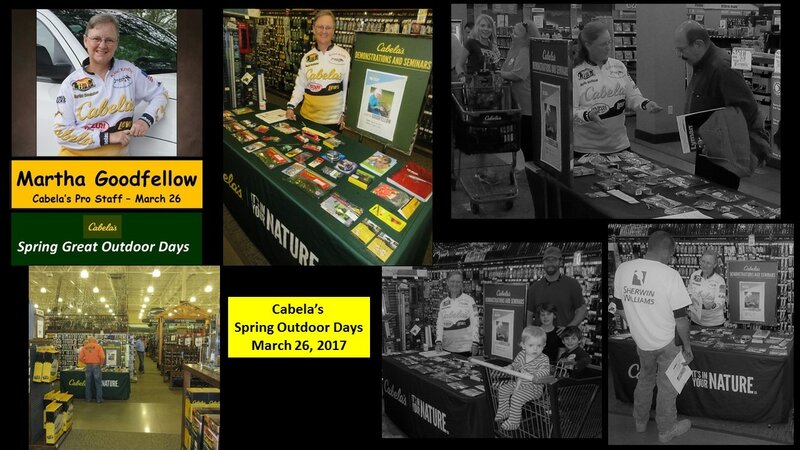 "Pre-Spawn Bass Fishing Tips with Martha Goodfellow "
Helping Cabela's guests learn more about fishing. Yo-Zuri "Rattl'n Vibe" puts bass in the boat! 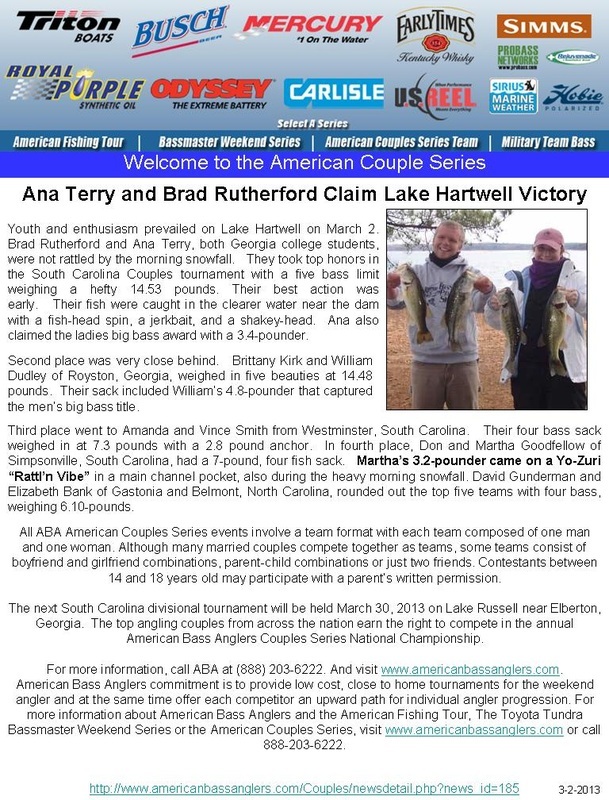 "Most Outstanding Public Relations Award"
Reel used: "Effortless" model by US REEL that is spooled with Yo-Zuri "Hybrid Ultra Soft" 15 pound test line. 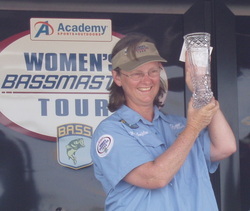 (Garland, TX) – The Lady Bass Anglers Association (LBAA) 2011 Rookie of the Year Pam Ridgle is starting out 2012 like a house afire as she earned a hard fought come from behind victory to take home the win in the Lady Bass Anglers Association’s Lake Ray Hubbard tournament. 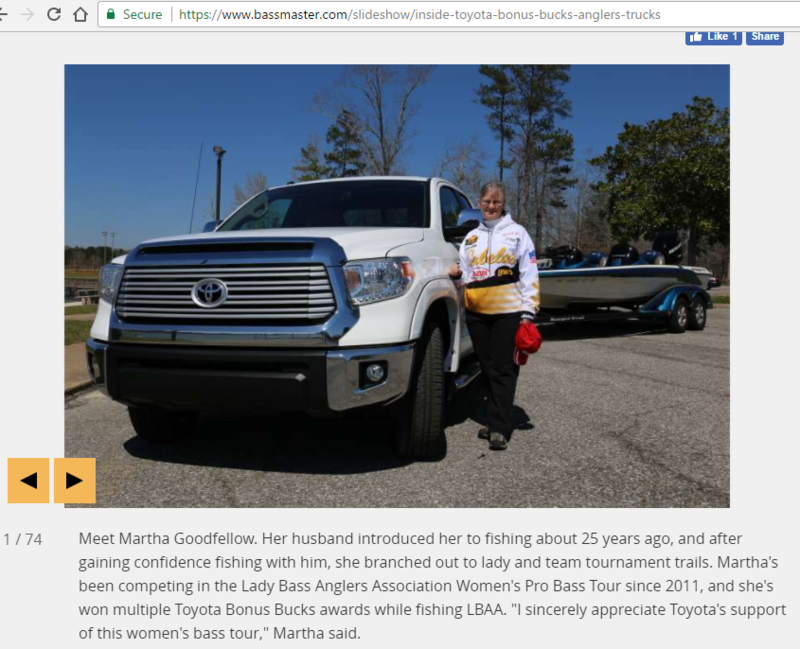 Ridgle’s two-day ten bass total came to 24.27 pounds to put her atop the leader board…. 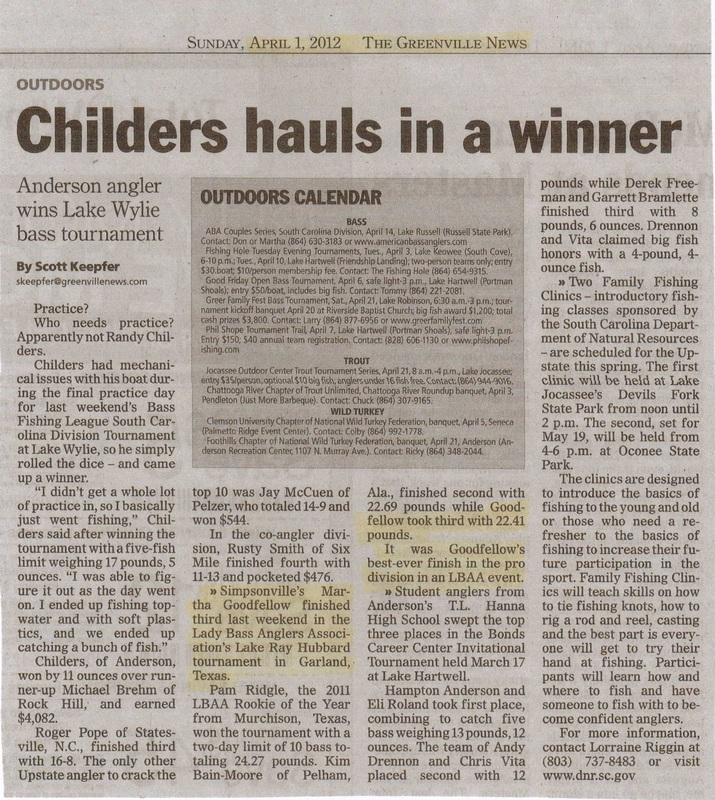 address tough issues so that we can all enjoy our outdoor sports. 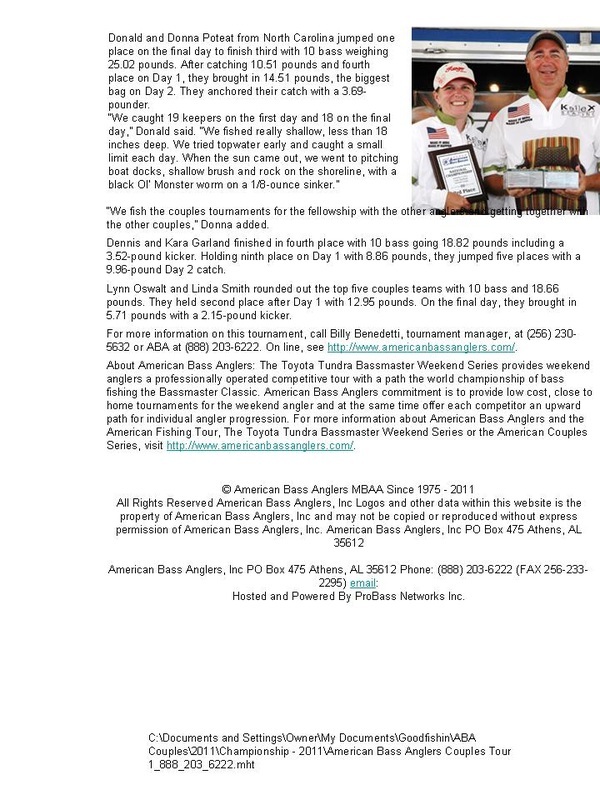 Thank you US Reel for providing the reel. 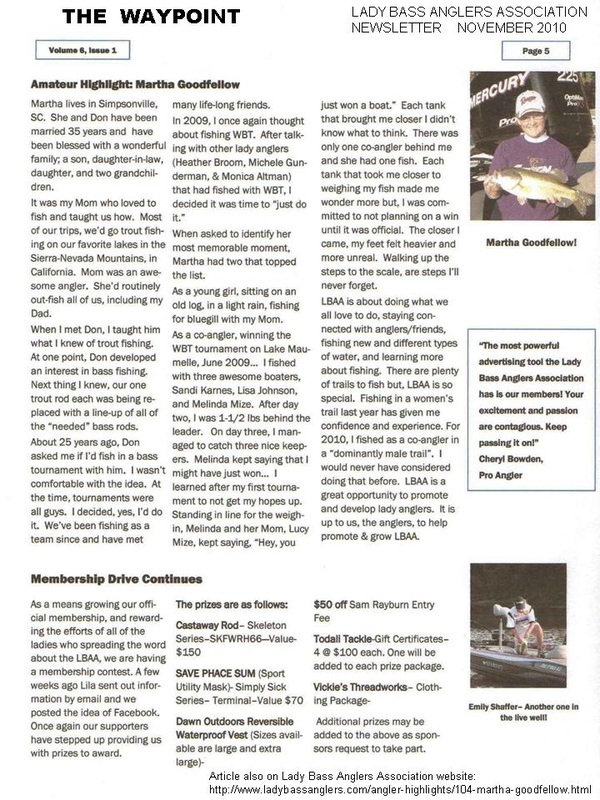 Deciding to fish as a Co-angler or a Boater brings up plenty of questions, I know because I’ve experienced both. 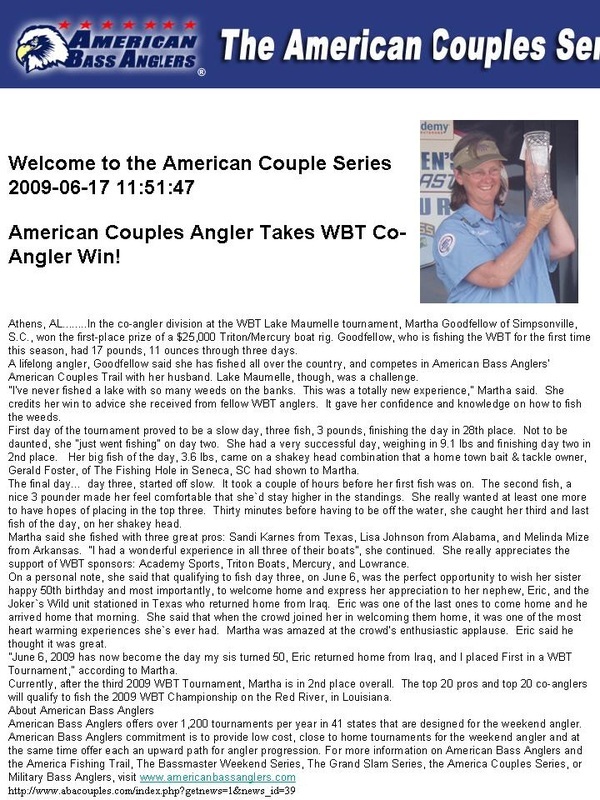 In 2009, I decided to fish a lady tournament trail as a Co-angler. 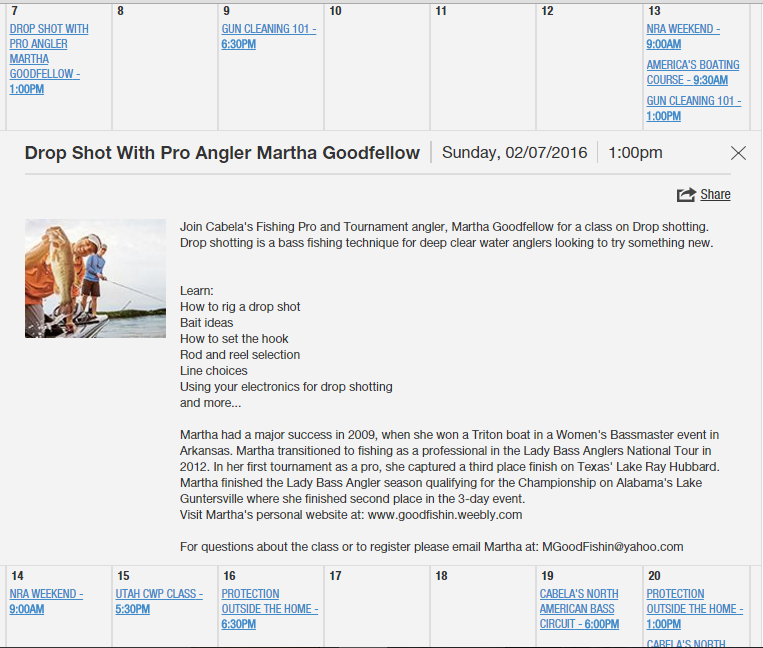 I asked my friends that fished the ladies trail and I did research online about what a co-angler needed to know. 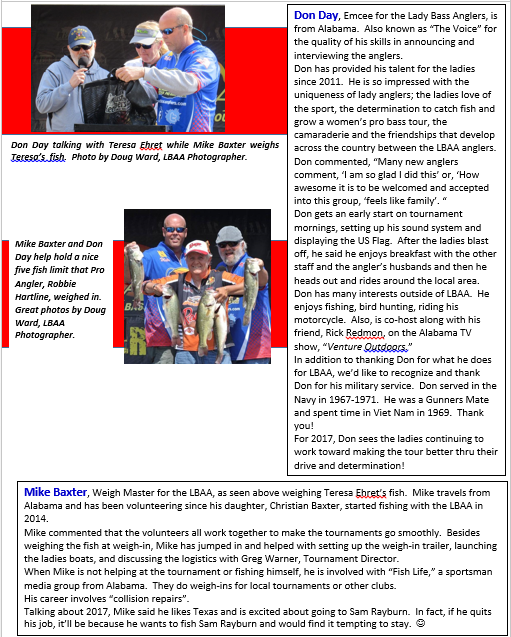 All the anglers that I have fished with and met have been a very nice and supportive group. 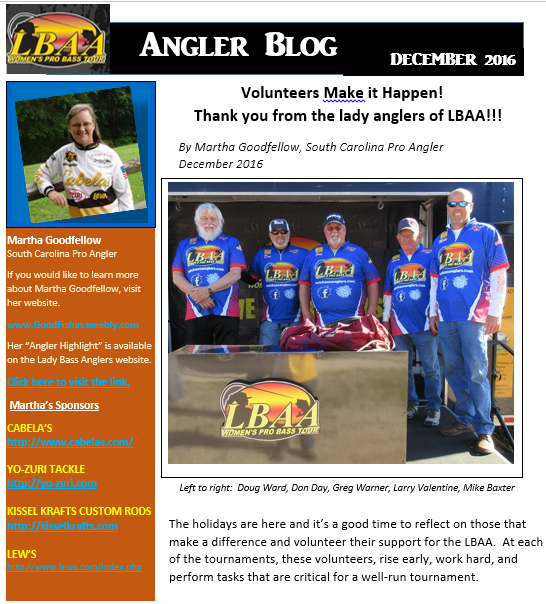 Read and understand the LBAA Rules and at the pre-tournament meeting, listen for local rules and any additional information. 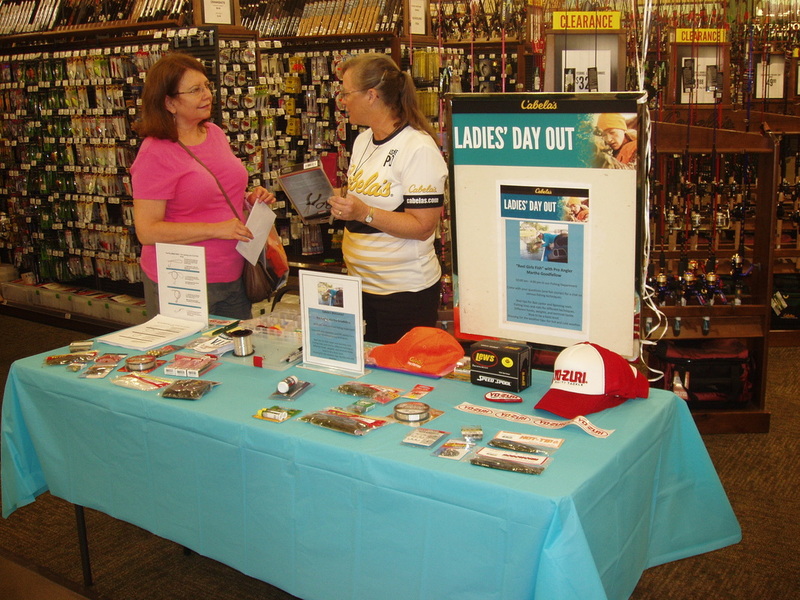 Make a list of what you need the day of the tournament – including your life jacket/water/tackle….cash for your share of the boater’s gas/oil cost for the day. 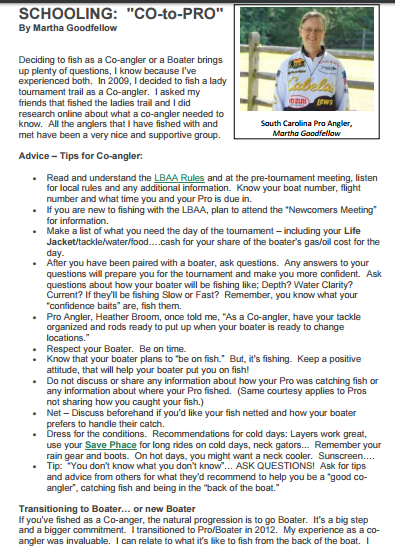 After you have been paired with a boater, ask questions. Any answers to your questions will prepare you for the tournament and make you more confident. 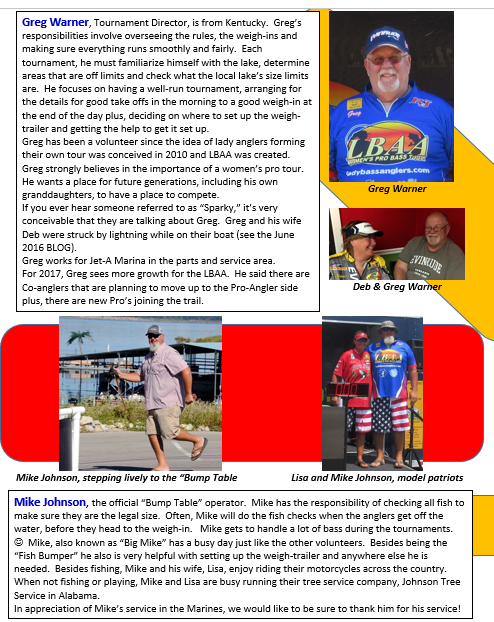 Ask questions about how your boater will be fishing like; Depth? Water Clarity? Current? 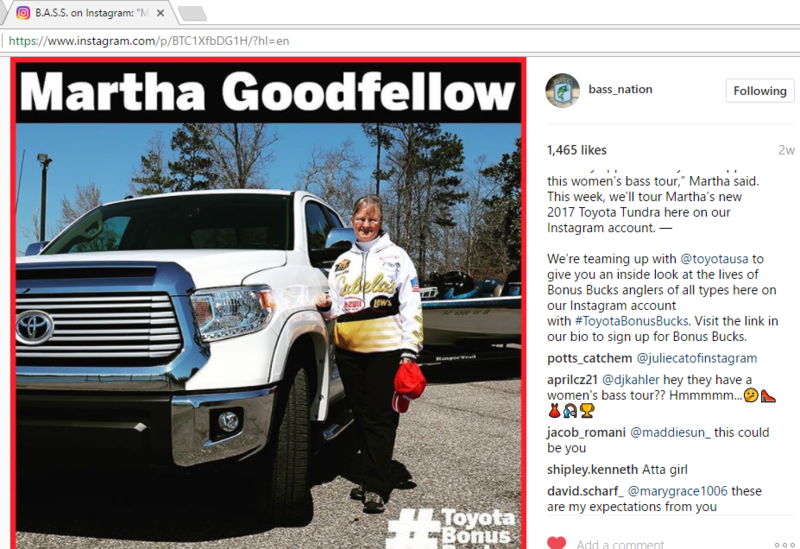 If they’ll be fishing Slow or Fast? Recommendations for bait? (if you don’t have your own plan.) 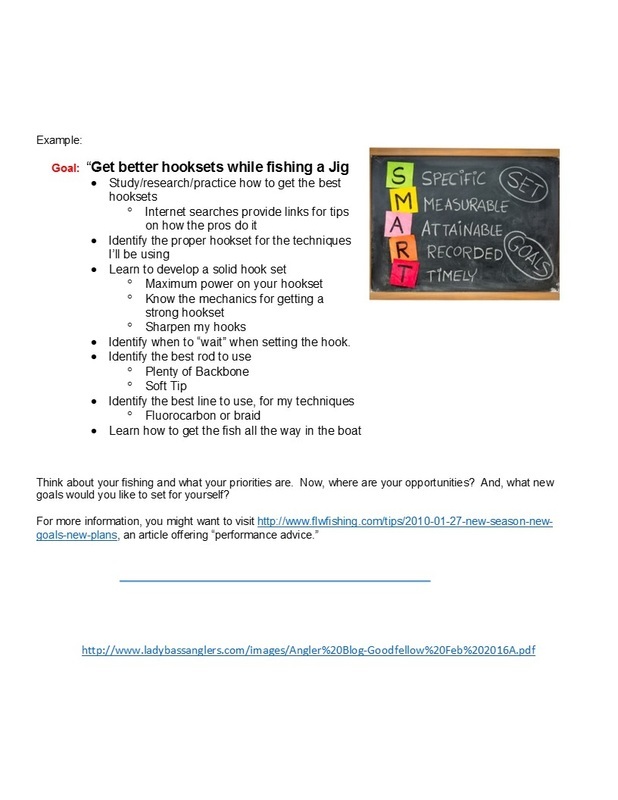 Remember, you know what your “confidence baits” are, fish them. Respect your Boater. Be on time. 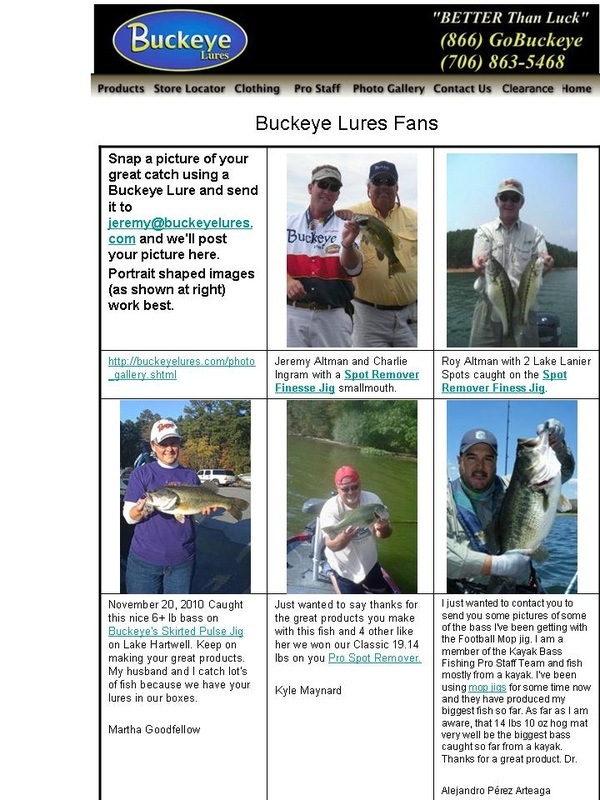 Net – Discuss beforehand if you’d like your fish netted and how your boater prefers to handle their catch. Dress for the conditions. Recommendations for cold days: Layers work great, use your Save Phace for long rides on cold days, neck gators... Remember your rain gear and boots. 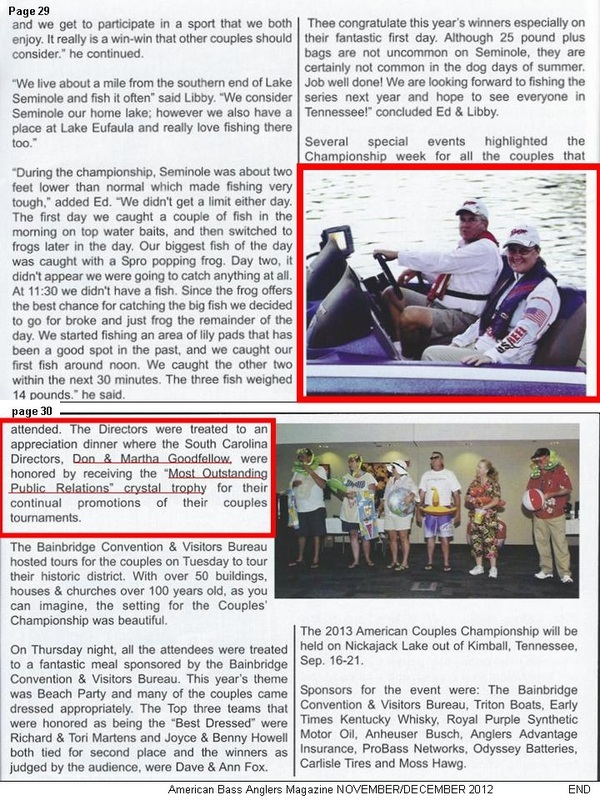 If you’ve fished as a Co-anger, the natural progression is to go Boater. It’s a big step and a bigger commitment. 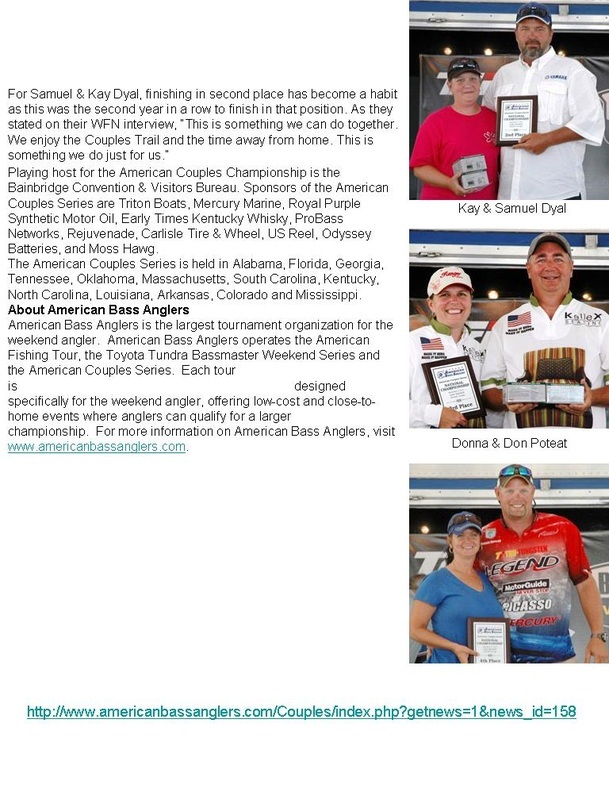 This year, I’m going to fish as a boater. 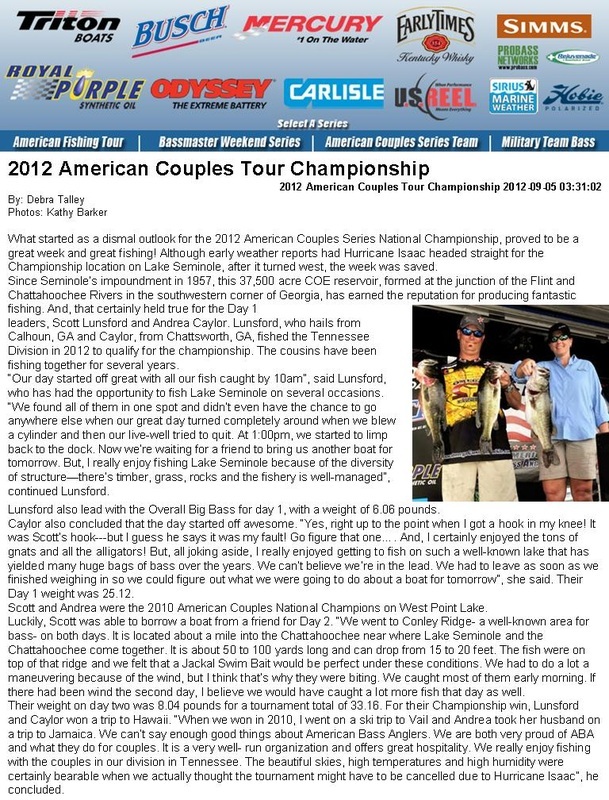 My experience as a co-angler is invaluable. I can relate to what it’s like to fish from the back of the boat. 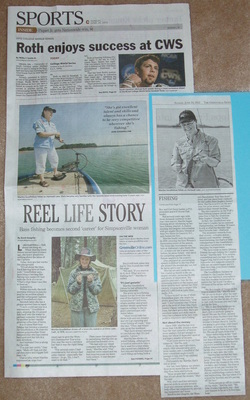 I have learned a lot, experienced fishing new waters and have seen a lot of different conditions. Now, it’s time for me to prepare myself to perform as a boater. 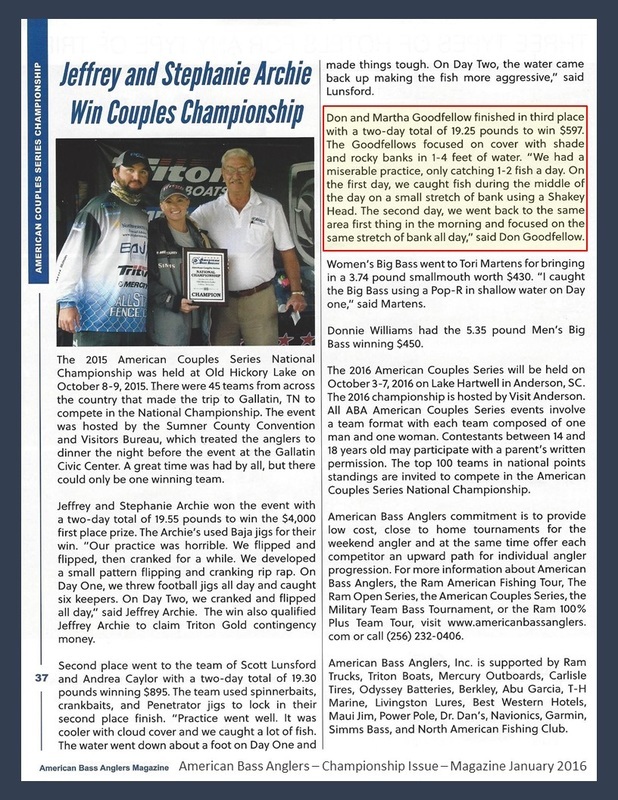 Just as when I started as a co-angler, I’m asking lot’s of questions. My plan is to become as familiar with my boat as I can and to make sure that I can safely handle the boat in all conditions. 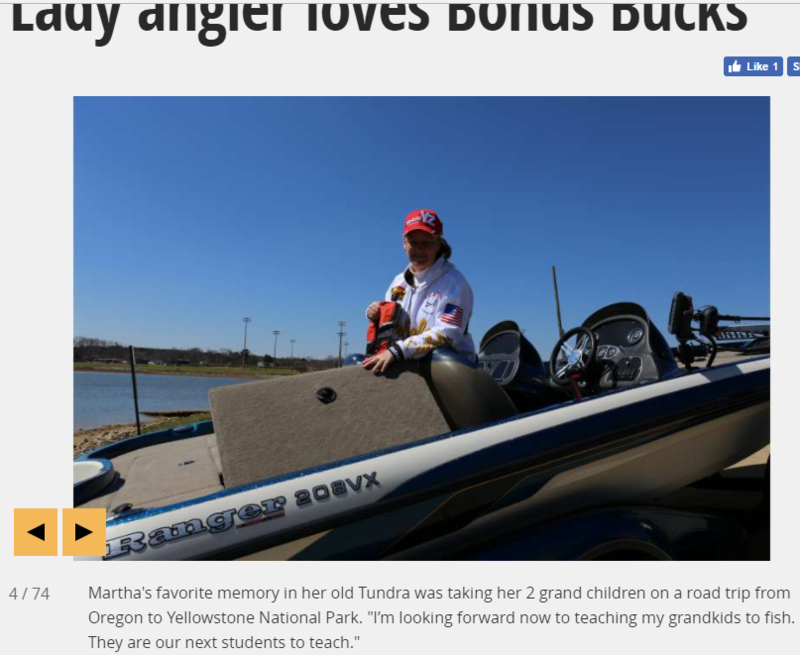 Time on the water and time behind the wheel, are the best teachers. Boat handling is my prime goal. I’ve driven our boat plenty of times. Usually cruising about 35 mph and just enjoying life. 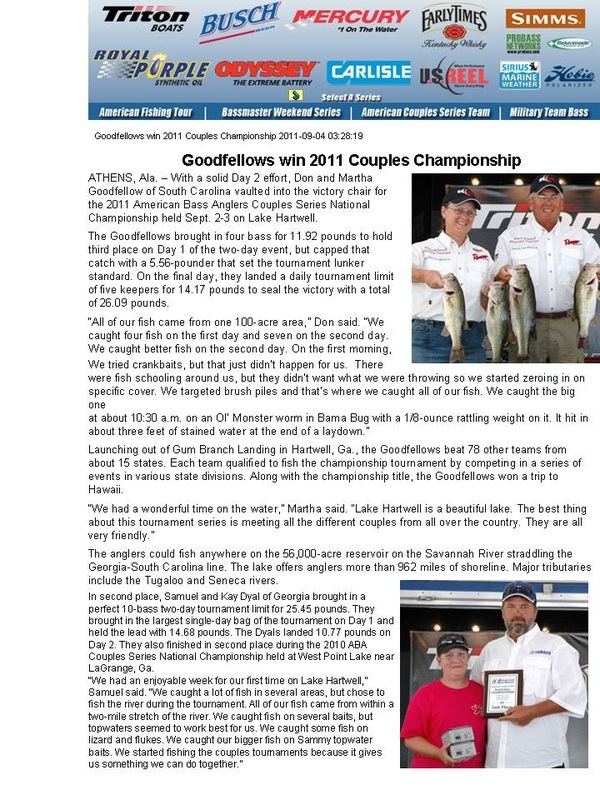 Now, tournament fishing, lends itself to getting to your next spot quickly which means increasing speed. Practice-Practice-Practice. Traveling at higher speeds, you need to experience keeping your eyes out for other boats, navigating safely, and using your GPS while boating. Most important thing to keep in mind is SAFETY! 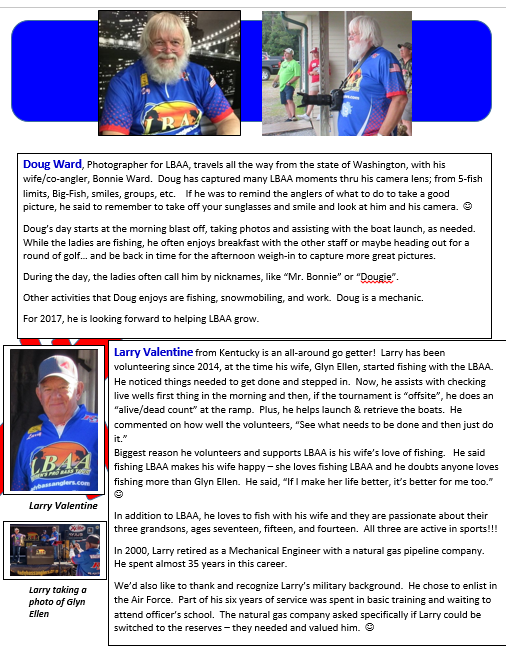 Read and understand the LBAA Rules. Be sure to listen at the pre-tournament meeting for additional information. 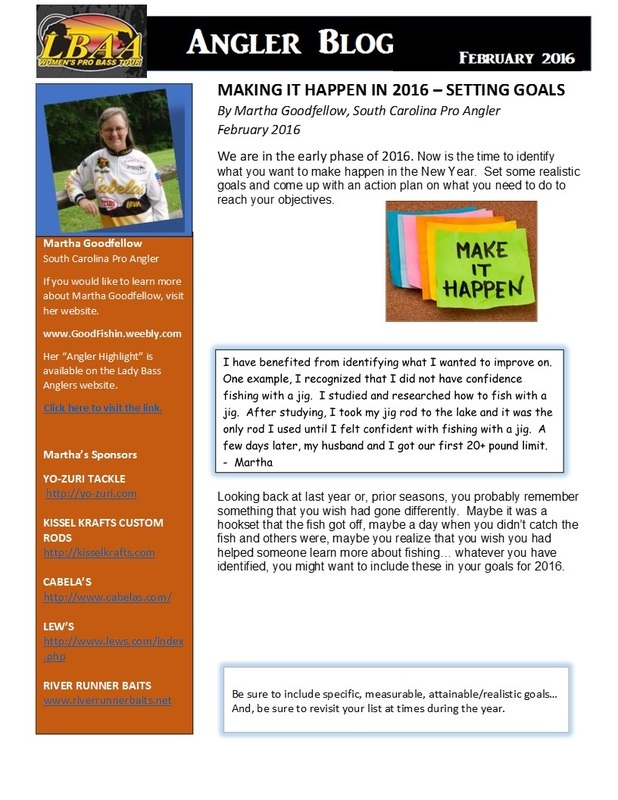 Make a note of your boat number. Know what is off limits. Ask questions – especially for safety while navigating on new water. 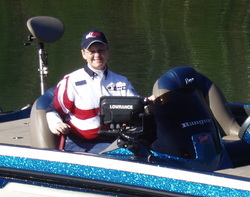 Practice and improve boat handling. 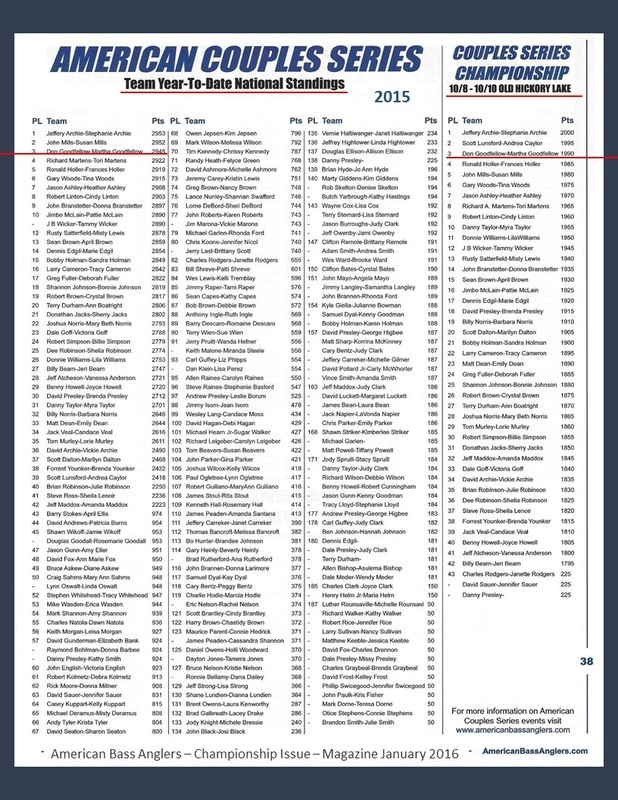 Practice the speeds you’ll actually be driving on tournament days. 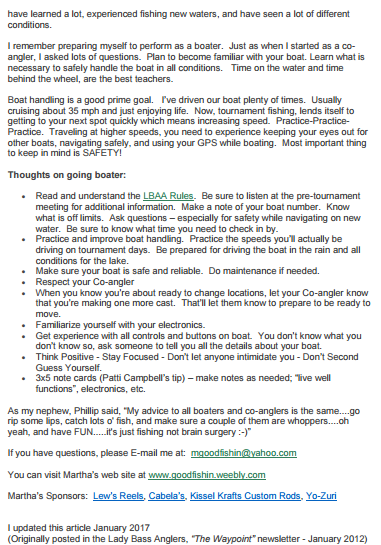 Be prepared for driving the boat in the rain. 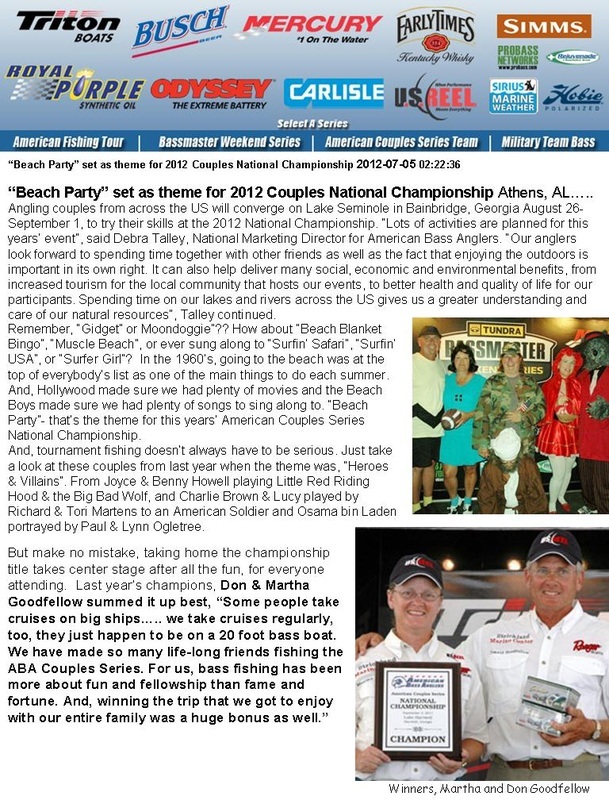 Make sure your boat is safe and reliable. Do maintenance if needed. 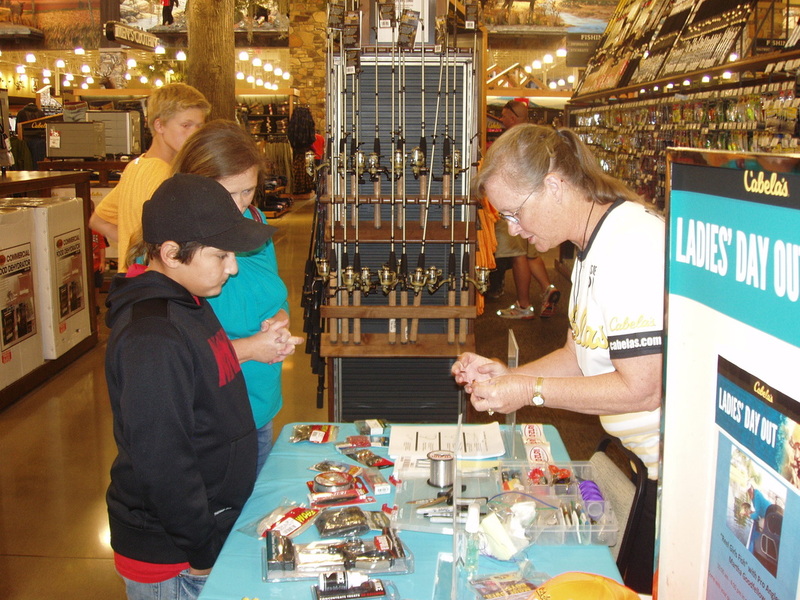 When you know you’re about ready to change locations, let your Co-angler know that you’re making one more cast. That’ll let them know to prepare to be ready to move. Familiarize yourself with your electronics. 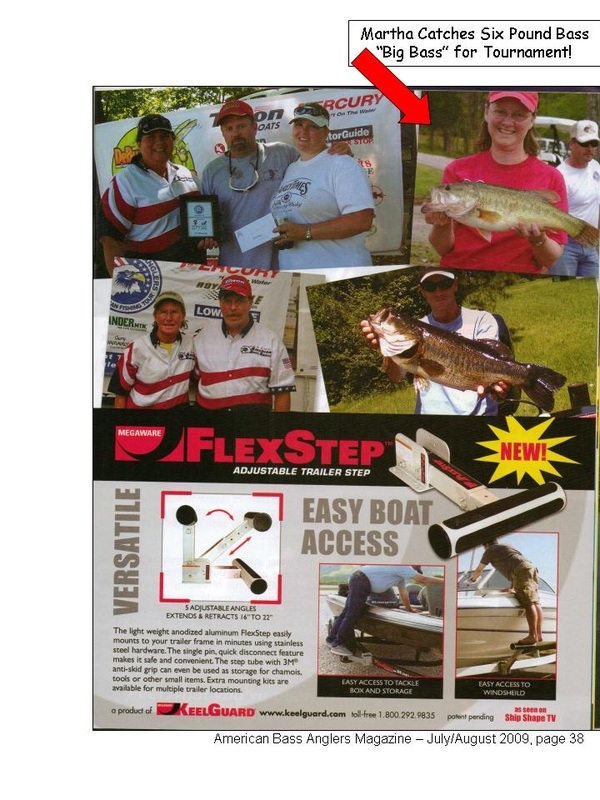 Get experience with all controls and buttons on boat. 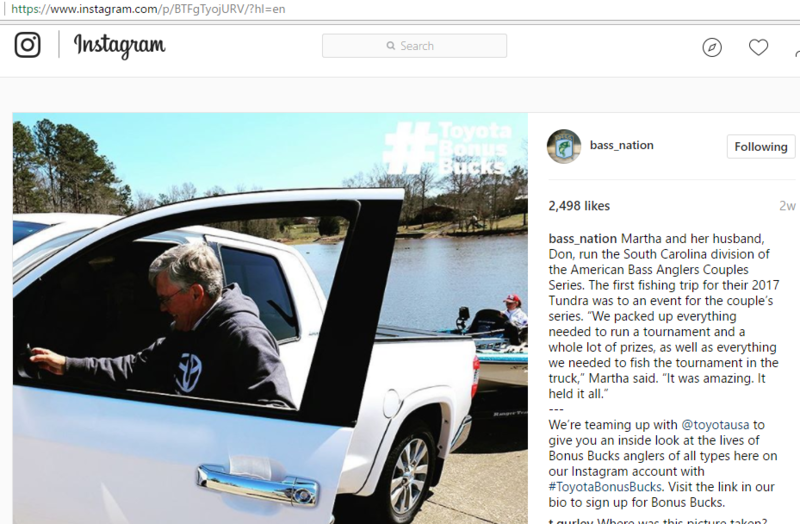 You don’t know what you don’t know so, ask someone to tell you all the details about your boat. Think Positive - Stay Focused - Don’t let anyone Intimidate you - Don’t Second Guess Yourself. 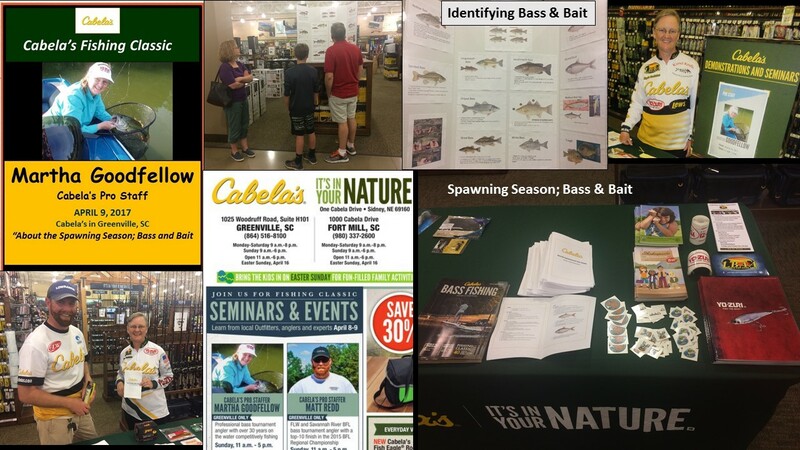 And, if you want ideas on how to improve locating and catching bass, I suggest reading, “How to Find Bass Fast,” Bassmaster Magazine-November 2011. On our way back from the Old Hickory tournament, we decided to stop at Bass Pro Shops and buy new CO2 cylinders for our “automatic floatation devices” (PFD’s), a.k.a. life jackets. 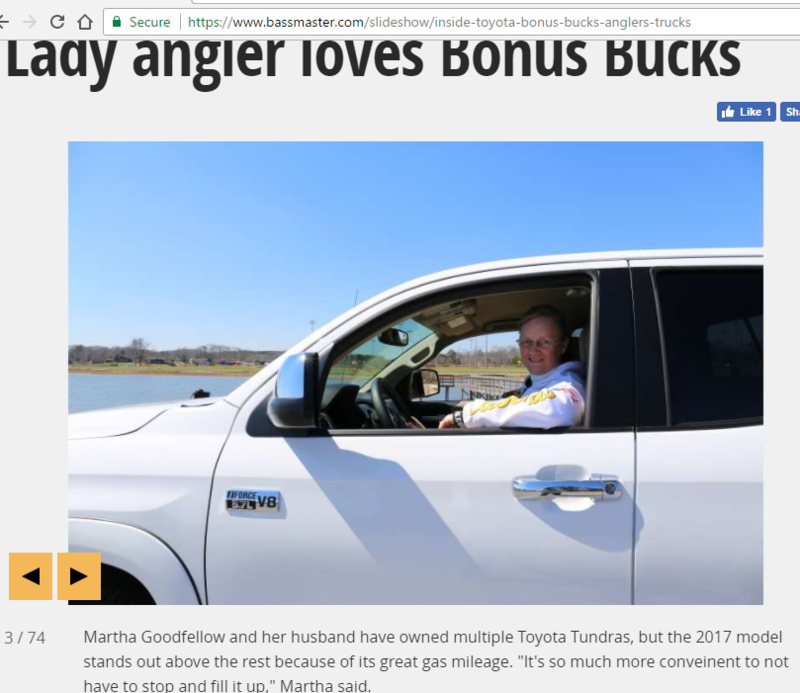 So glad we did… When we got there, the associate found that my CO2 cylinder was unattached and just laying loosely in my vest. Over time, these cylinders can work themselves loose. 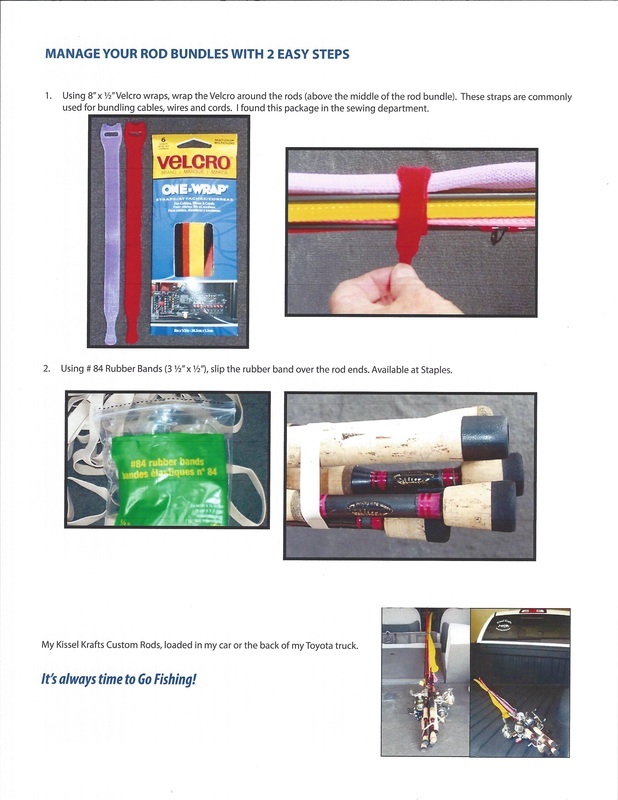 If you haven’t checked your life jacket lately, now would be a great time to check your life jacket. 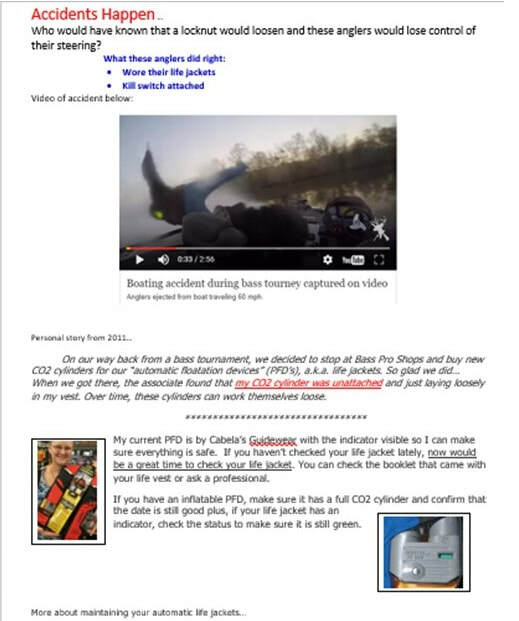 You can check the booklet that came with your life vest or ask a professional. 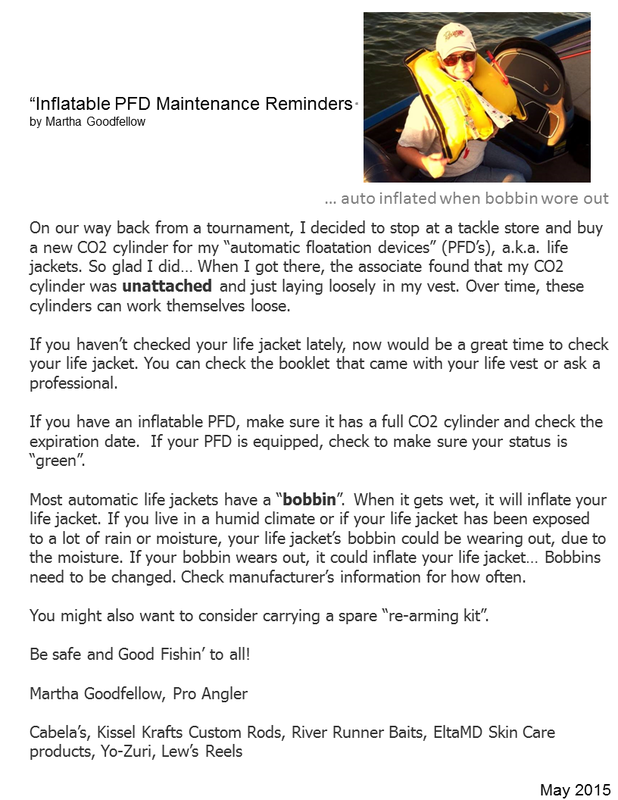 If you have an inflatable PFD, make sure it has a full CO2 cylinder and that all status indicators on the inflator are green. Automatic life jackets have a “bobbin”. When it gets wet, it will inflate your life jacket. 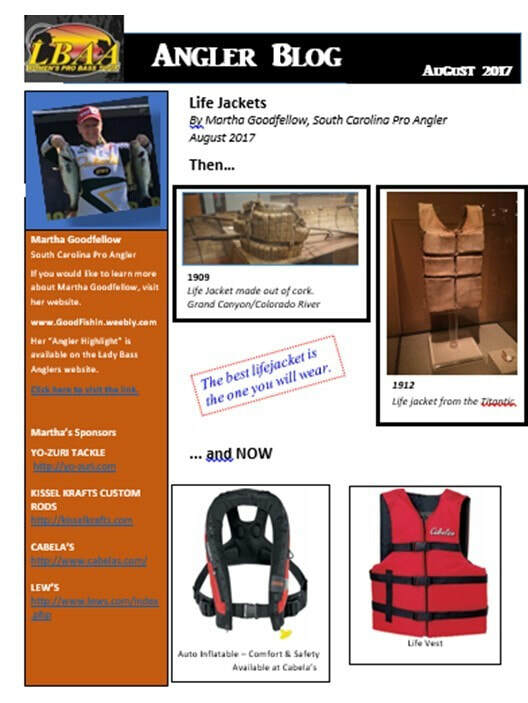 If you live in a humid climate or if your life jacket has been exposed to a lot of rain or moisture, your life jacket’s bobbin could be wearing out, due to the moisture. If your bobbin wears out and is inside one of your boat’s compartments, it could inflate itself… Bobbins need to be changed. Check manufacturer’s information for how often. You might also want to consider carrying a spare “re-arming kit”. 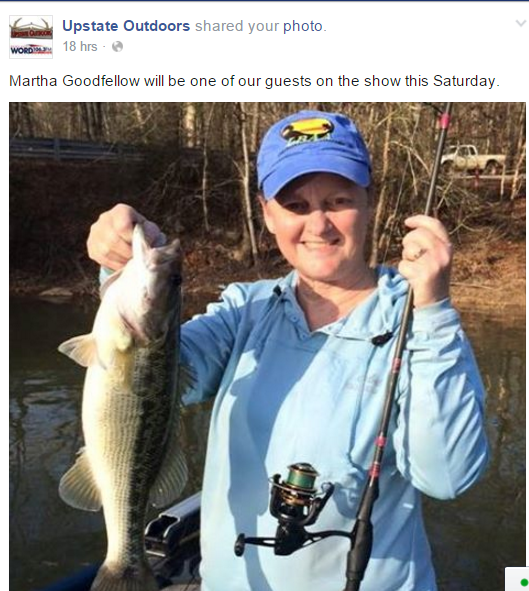 Be safe and Good Fishin’ to all! $600 = 1099-MISC No it’s not a secret code but, it’s something that if you know about, it might save you some money when it comes to tax time next year. 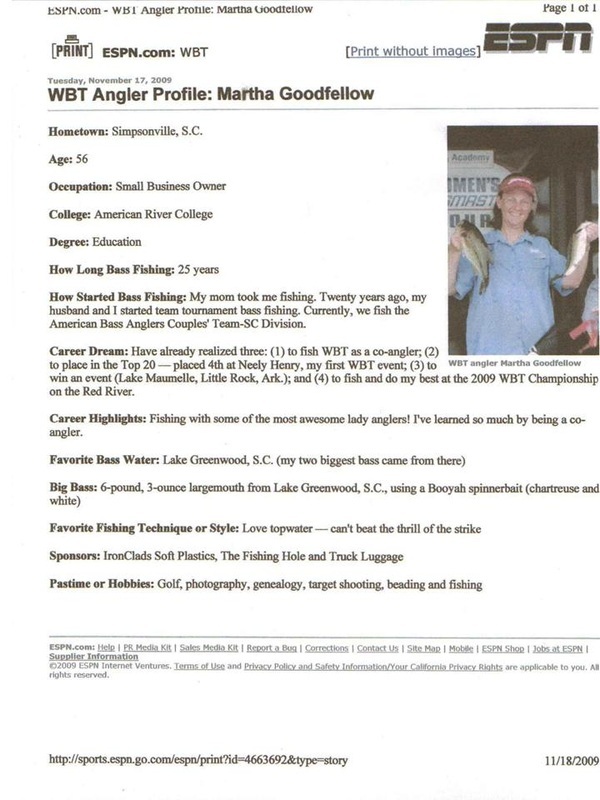 Did you know that when you earn $600 or more from fishing a tournament circuit, your income will be reported to the IRS and you will receive a 1099-MISC for the reportable income? 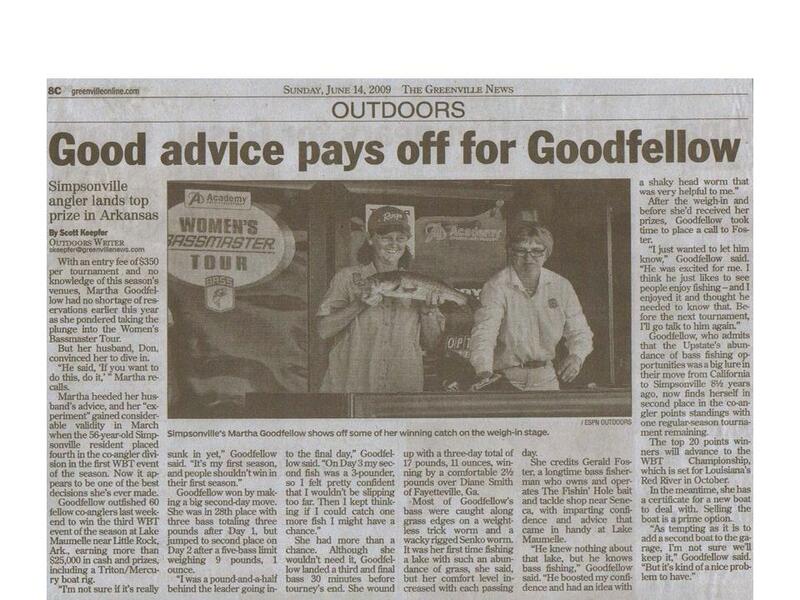 When I started fishing the lady’s trail in 2009, a fellow angler, Monica Altman, shared some great advice. 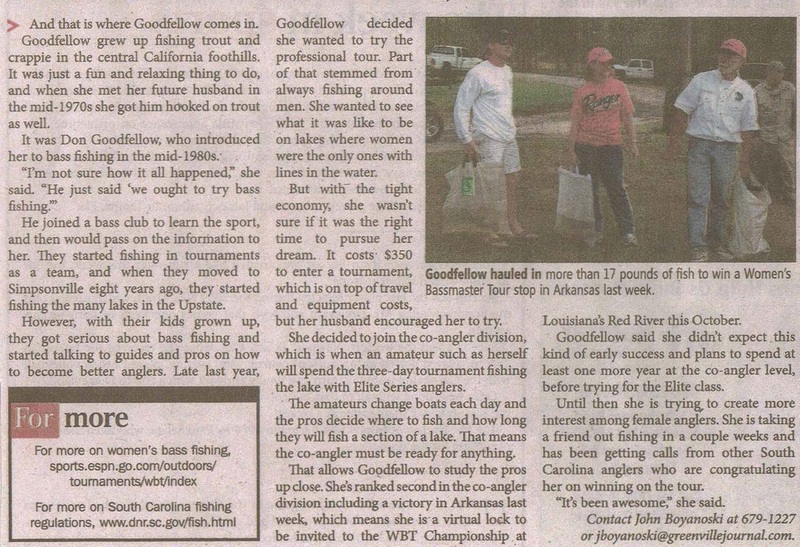 She recommended that I save all of my receipts and record my fishing expenses to offset my winnings. Some expenses, like tournament entry fees are obvious expenses. But, did you know that the mileage that you travel to and from a tournament might also be deductible? 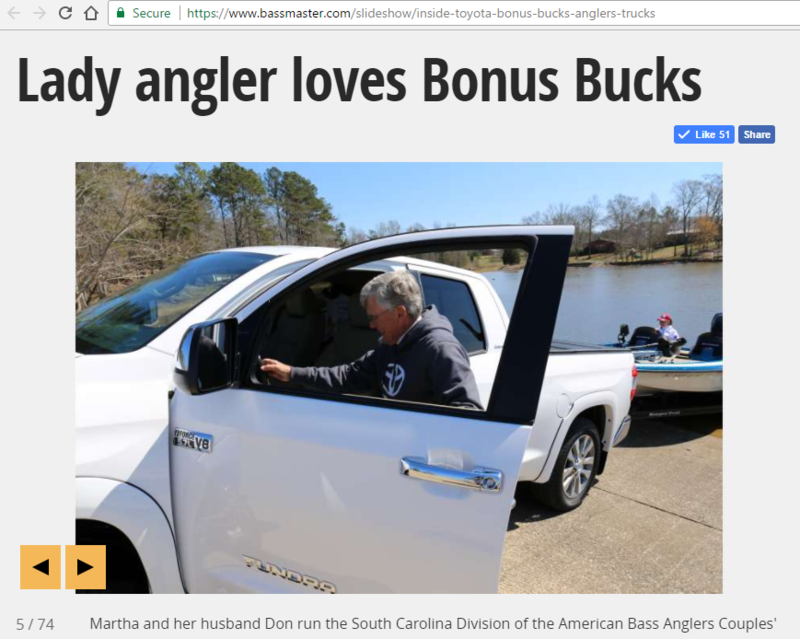 How about the mileage to and from the tackle store for the baits that help you win? I recommend you keep track of the miles you travel. Probably the best way to track your mileage is to make a note of the starting mileage on your vehicle and then the ending mileage.